Apart from the famous wines, this region is rich with world heritage sites, history and art. Giles Fallowfield bases himself in Reims for a busy long weekend. Read the full guide to Champagne, including the best houses to visit, plus top places to stay, eat, shop and relax. The winemakers of Kent and Sussex may disagree, but there’s only one place that’s in easy reach of the UK and produces unique wine sought the world over as the drink of celebration. Nearer and quicker to drive to than Paris, you can reach Champagne in four hours from London without setting foot on a plane. Once there, you are among the vines in just a few minutes’ drive of Reims or Epernay, the two towns at the region’s cultural, gastronomic and vinous heart. For a long weekend, Reims is a good base from which to pack in two full days exploring the city on foot; half-day outings using the signposted wine routes into the nearby Montagne de Reims villages and vineyards are easily manageable. If you have more time, consider Epernay as the starting point. It lies at the intersection of three of the four main vineyard regions – the southern end of the Montagne de Reims, the northern tip of the Côte des Blancs and the Marne Valley running east to west between the two. Reims, half an hour’s drive away, is close enough for a day’s exploration. Stay in Epernay or nearby Aÿ if you are planning to go mid-harvest (likely to be late August or early September). This is the most exciting time to visit but more difficult to plan as the Champenois have to accommodate their pickers, and the small-grower operations you’ll want to visit to experience the real beating heart of the region will be busy picking and pressing their grapes – although some producers with rooms do offer specific harvest tour packages. The city is intimately entwined in French history and boasts four UNESCO World Heritage sites within its walls. The baptism of Clovis by Rémi, bishop of Reims, took place on Christmas Day in 498AD on the site of the Notre Dame Cathedral, effectively giving birth to the kingdom of France. This subsequently made Reims the coronation city of choice for 33 kings of France between 863, when Louis the Pious was crowned, and Charles X in 1825. If you could go back in time, just imagine witnessing the Dauphin Charles VII being lead into Reims by Joan of Arc on the 17 July 1429 for his coronation here after the raising of the siege of Orleans. Walking around the city centre, large parts of which are pedestrianised, vistas of the massive gothic cathedral seem to open up at every junction. It’s an awesome structure, at nearly 150m long inside and towering 81m above the city – there’s even a rooftop walk you can take to enjoy the view. The stained-glass windows with scenes depicting the vineyard year in the south-facing window made by Jacques Simon in 1954 particularly impress – you can’t get away from Champagne’s all-pervading influence, even here. Wonder too at the vivid colours in the adjacent window by Marc Chagall. If you prefer paintings, make time for a visit to the Musée des Beaux-Arts, which houses 27 works by Corot, as well as fine examples of Monet, Renoir, Gauguin and Matisse’s art. It’s only a few blocks to the west of the Cathedral, on Rue Chanzy. A visit to the St-Rémi Basilica, the former bishop’s tomb, became part of the coronation ceremony, just like the post-coronation banquet held in the Palace of Tau, next door to the cathedral – two other UNESCO sites you can see today. The Tau Room, decorated with 15th-century tapestries telling the story of King Clovis, is where the banquet was held. The final heritage site, the St-Rémi museum, houses many artefacts including a large military collection from battles ancient and modern right up until the Franco-Prussian war. Due partly to its location between Paris and France’s eastern border, Reims is no stranger to conflict. World War I raged for four years in this region and destroyed more than 80% of the buildings. The city was on the frontline again in World War II with the armistice eventually signed here on 7 May 1945 in the War Room of US General Eisenhower’s supreme headquarters, which occupied part of what was Reims’ technical college. The site was subsequently turned into a museum and the ‘Salle de la Signature’ has been preserved today just as it was then. Make it a priority to go round one of the famous houses’ cellars that make use of the crayères (chalk pits), some of which are more than 30m deep and originally dug by the Romans looking for material to build the city then known as Durocortorum. 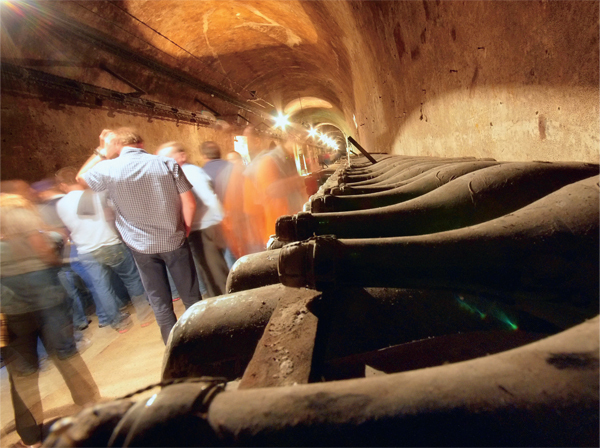 The oldest cellars in Reims are grouped on the southern side of the city around the Place du Général Gouraud (Veuve Clicquot, Pommery, Taittinger and Ruinart). But that’s for after lunch – we shouldn’t forget this is France and everything comes to a halt at noon. As the Rémois quickly switch from work to pleasure mode, restaurants fill up fast so don’t get caught out. By the time you’ve found a table and had the obligatory fizzy aperitif, you’ll feel decidedly peckish. Brasserie du Boulingrin and Le Café du Palais are fine choices (see box, right). Now you’ve got your bearings you can move on to the slower pace (except in harvest) of touring the villages and vineyards to try and buy small-grower Champagnes. If you can’t get them direct at cellar doors, stock up in one of Epernay’s wine shops. It’s not just wine with bubbles you are buying into, but centuries of history and tradition in the glass. The Champenois are rightly proud of their heritage. By train or plane to Paris, then the TGV train from Gare de l’Est to Reims. 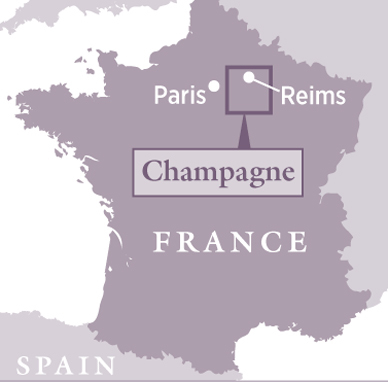 By cross-Channel ferry or Eurotunnel to Calais, then a three-hour drive to Reims (Epernay and Aÿ are an hour further south). It’s essential to have a car to see smaller villages and to carry your purchases.